The Outsider Folk Art Gallery is pleased to announce an exhibition of paintings by artist, musician, and Grammy-nominated song-writer Karl Mullen from May 7 - June 19, 2010. You are invited to an opening reception Friday, May 7 from 6-8, with a musical performance by the artist at 8 PM! Karl Mullen is a Dublin-born, Philadelphia based painter and musician. 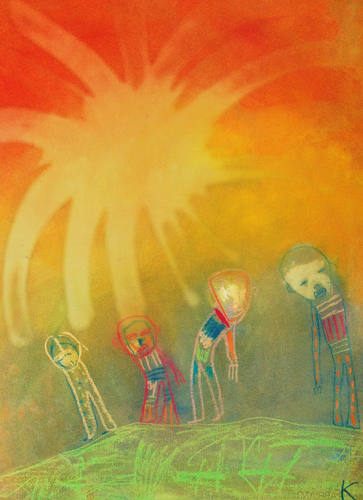 The Outsider Folk Art Gallery is pleased to exhibit his work from May 7 - June 19, 2010. He has developed his own non-traditional approach to art making and materials, utilizing walnut oil, raw powder pigment and a wax medium that coalesce into color-saturated, luminous images. Painting largely with his hands, Karl creates distinctive, poetic figures that float on fields of color. The imagery in his paintings is born out of Irish music, poetry, myth, and folklore. Outsider Folk Art Gallery 201 Washington St. suite 504 (5th Floor, GoggleWorks Center for the Arts) Reading, PA 19601 www.outsiderfolkart.com 610-939-1737 p, 610-939-1738 f hours: Tuesday-Saturday 10-5 and by appt.